WHAT IS JH Institute ? 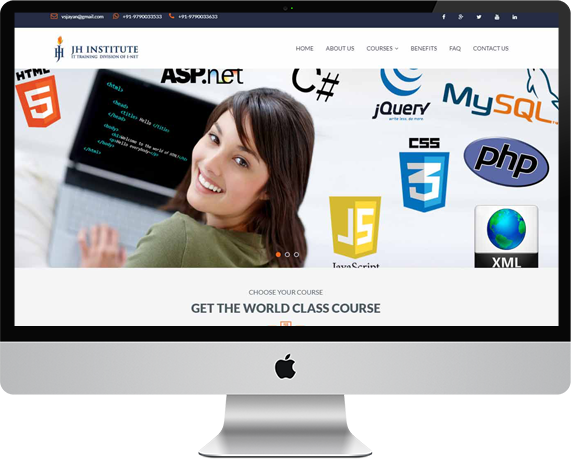 Jhinstitute started in the year of 2009, a vast training programming organization in Chennai offering practical oriented training classes for students as well as job seekers. In fact, this is one of thebest PHP training institute in Chennai, India. We at Jhinstitute, structuring a programming skills for the fresher’s who are seeking in growth in their particular domain through robust fundamentals. Our tech giants provides training courses from channels like PowerPoint, video tutorial, online courses, seminars, webinars and more. Get value added courses like PHP & MySQL, Web Design, SEO & SMO, and Quality Testing for successful growth of the career. By completing the courses students are guaranteed to get 100% percent placements since we have successful placements records of the students. Shine in your career,IT Industry Awaits You! PHP is the most advanced scripting language using for web development which is the free and open source. MySQL is the relational database management system. HTML helps in creating web pages and web applications for grouping text files to triumph font, color, graphics, and hyperlinks. CSS language used for presentation in a document written with HTML. Bootstrap is the front-end framework used for designing websites and web applications. Feel the pleasure of joyful study environment, start as a fresher where the outcome will be like a pro in IT industry. Learning methodologies scripted as best in class by the certified professional for easy way to connectindustry needs in reality with rich interactive learning. Our training rates are lower cost than industrial standards and result driven dictum focused. Jhinstitute started in the year of 2009, a vast training programming organization in Chennai offering practical oriented training classes. Offering vast training courses like Web Design, Web Development, Manual and Automation Testing, Digital Marketing.